Why do so many outstanding B&Bs choose to belong? What you pay buys more exposure and promotion of your inn that you get from anywhere else — at no additional cost. MBBA’s high standards for safety, quality and comfort give guests a level of assurance that sets you apart. MBBA represents your business interests when lawmakers or regulators start making changes. Attract more guests. Make more money. Manage the business. Stay on trend. MBBA helps. Does your B&B qualify for membership? Answer “yes” to these eight questions, and you can put MBBA to work for you. 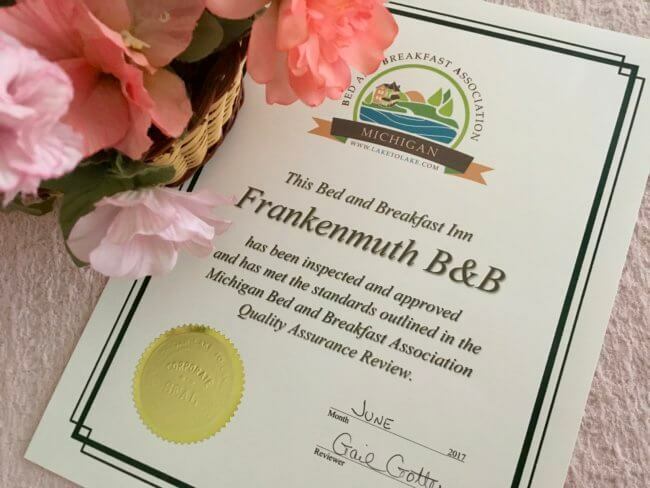 Are you a Michigan bed and breakfast? Do you offer at least two guest rooms? Do you provide a full or continental breakfast and include it in the room rate? Are bathrooms either private or, if shared, limited to two guest rooms or five guests sharing a bath? ** Certain exceptions may be possible. Inquire. “Individually decorated” means each guest room is different. 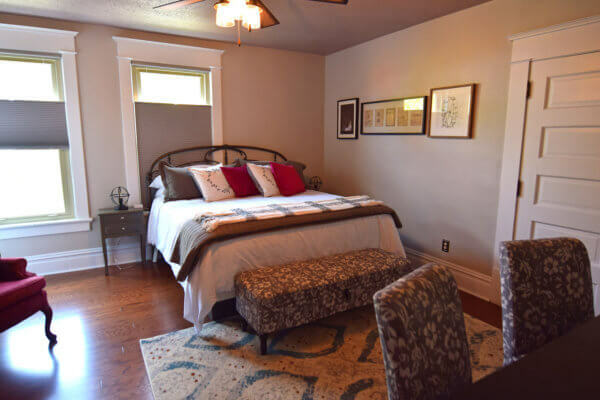 This room is at Hart House B&B. All of the following are included in what you pay to belong, starting with hands-on, individualized assistance with your listing on laketolake.com. This includes assistance with writing, photo editing and data entry — whatever you need. Listing in up to three cities besides your own, up to 30 miles away. Facebook and Twitter too time-consuming? MBBA posts and tweets almost daily for members. You may add photos, comments and/or links. Periodic Facebook contests generate traffic and increase friends for B&Bs. Members can use our #MichBnB hashtag to improve their inns’ visibility in search. Blogging includes a new-member Q&A blog post about your inn exclusively. Email marketing reaches subscribers who have opted in. MBBA sells more than $25,000 each year in gift certificates. Guests spend them like cash at member inns, and they’re like cash to you, the innkeeper. You pay no commission. 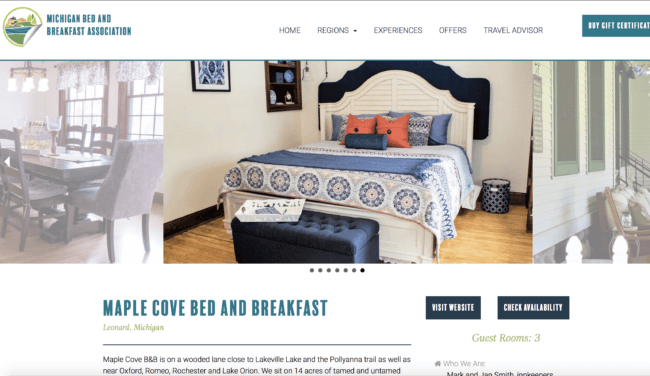 In a world of websites designed to make money off your business, laketolake.com exists only to market and support your bed and breakfast. Beyond a one-time $150 initial start-up fee, members’ support of MBBA has two parts: basic dues + room-night assessment. Membership dues pay for the basic operation of MBBA, one of America’s few staffed state B&B associations. Room assessments cover the innovative marketing initiatives that showcase member inns and make our website competitive with the commercial directories for which you pay to list your properties. All members pay the same annual dues regardless of the size of their B&B. This funds the nuts and bolts and staffing for everything it takes to generate the benefits designed to clinch your business success. Pay your dues in one fell swoop each year, online or by mail, check or credit card. Or pay $35 monthly by automatic credit card deduction. Note: a small fee is pro-rated into the monthly payment to cover card processing. Annual payment offers the ease of a single payment. However, if you resign your membership during the year, there is no refund. If you pay monthly, you’re a member as long as you want and stop when you want without financial penalty. The room-assessment program is simple: Collect $1 per room night sold and remit the total each month, up to a cap of $1,500 per calendar year. What an inn pays scales up or down according to the size of the operation, the number of days per year the B&B is open, and the success of the business in good years and in lean ones. Payments are on the honor system. Only the MBBA administrator knows how many guest room nights members are selling. How do most innkeepers pay for the assessment? They add a $1 per night association assessment fee to each guest’s invoice, pre-tax, and do not regard the dollars collected as their money. This $1 per guest room night covers the bells and whistles that keep our marketing tools competitive with the commercial directories. It’s always a plus when a trusted third party reassures guests your B&B is on the up and up. That’s the point of the MBBA Quality Assurance Review program. Quality certification has never been more critical than today, when the good name of B&Bs is often abused by unregulated home shares calling themselves bed and breakfasts. When your inn is quality-assured by our independent reviewers, you prove beyond question that your property stands apart. Posting the MBBA logo prominently on your website tells those seeking quality that you have been inspected for meeting safety requirements and for adhering to best practices associated with cleanliness, food service and hospitality. Check the Quality Assurance Review Checklist to see if your inn will meet the standards. 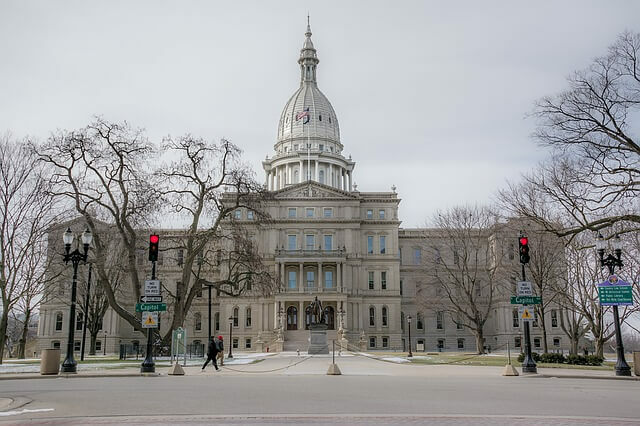 MBBA goes to Lansing to advocate for laws that benefit B&Bs and tourism. Think you can’t fight city hall? Sometimes you’re right. But when all our respected B&B innkeepers join forces across Michigan, we can work together and have an impact. That’s the beauty of an association and a primary function of MBBA. When we collaborate with others who represent larger lodging and tourism businesses, we are an even more formidable force with which to be reckoned. What you bring to membership is clout in the form of your voice. What membership gives back is an entire orchestra of voices that affects legislative and regulatory activity that impacts our industry and your B&B business. 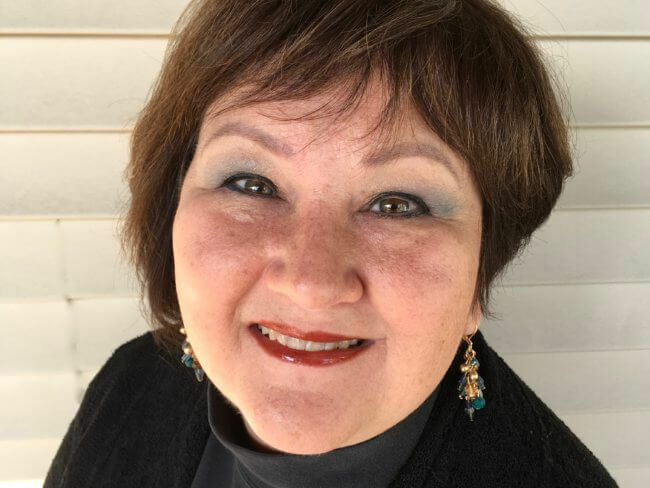 Michigan Restaurant and Lodging Association…. Local and statewide strategies for addressing unregulated home stays. If you’ve been a B&B owner in Michigan, your business already has benefited from MBBA’s advocacy. Now, we need your voice. Imagine if we had stayed silent. For many innkeepers, owning a B&B is a second or third act. They’ve experienced success in other careers. They assume that learning by doing is the path to a successful B&B operation. But does any innkeeper have time to learn all about —and stay current on — responsive website development, liability coverage, ADA regulations, taxation, food safety practices, online travel agencies, room design and breakfast trends, keyword research, search engine optimization, and social media? How much more successful could a bed and breakfast become with a reliable and continuous flow of actionable information? Webinar series on topics ranging from hiring and training staff to email marketing to optimizing every page of your website for search engines. First, see the Quality Review checklist. Four reasons to join MBBA. See our short video. Is B&B innkeeping in your future? Join MBBA as an aspiring member.